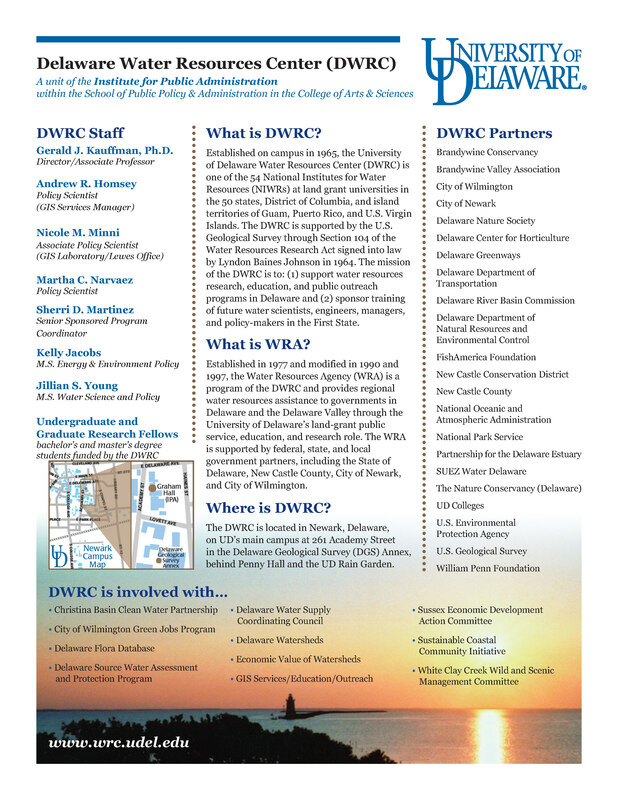 The University of Delaware Water Resources Center (DWRC), established in 1965, is one of the 54 National Institutes for Water Resources (NIWRs) at land-grant universities in the 50 states, District of Columbia and island territories of Guam, Puerto Rico, and U.S. Virgin Islands. The DWRC receives funding through Section 104 of the Water Resources Research Act of 1984, which was originally signed into law by Lyndon Baines Johnson in 1964. The U.S. Geological Survey administers the provisions of the Act and provides oversight of the nation’s Water Resources Centers through the National Institute of Water Resources (NIWR). To support research, education, and public outreach programs that focus on water supply, water management, and water quality – issues of considerable importance to Delaware citizens who are concerned about the future of our water resources. We are specifically charged with the “exploration of new ideas that address water problems or expand our understanding of water-related phenomena”. To foster and support training and education programs for the future water scientists, engineers, managers, and policy-makers who will lead the water resources research, planning, and management efforts in our state in the future.